The drafting of Gary Trent Jr. by the Trail Blazers couldn't have pleased anyone more than the 6-6 shooting guard's father. "I'm very excited about his opportunity to play in the NBA," Gary Trent Sr. says. "But it has extra special effect that it was my first team as well." The senior Trent played the first 2 1/2 of his nine NBA seasons in Portland from 1995-98, a sturdy forward who averaged 9.7 points and 4.7 rebounds in a mostly reserve role. Trent Sr. — listed at 6-8 but closer to 6-6, and a solid 250 pounds during his playing days — is a different body type than his son, who was chosen by Portland after his freshman season at Duke in the second round with the 37th pick in the June draft. Trent Jr. is 6-6 and a sinewy 210 pounds, in part by design through years of conditioning work spearheaded by his father. "I've done his player development since he was 5," Trent Sr. says by phone in an interview from his home in Minneapolis. That has included personal training that steered away from time in the weight room and focused on natural development. "Yout can't put kids on weights until they're 14 or 15," says Trent, who has served as personal trainer for all four of his sons as well as other youths in the Minneapolis area in recent years. "You do things that make your body strong naturally outside the weight room. "We've done a lot of speed training. That was around when I was younger, but it's a science today. You can customize your body. It's much more high-tech. Gary's body needs to be lean, long and quick to play in the current (NBA) game." The elder Trent put his son — whom he has called "my best friend" — through plenty of drills enhancing basketball skills, but placed an emphasis on conditioning from an early age. "When I was young, they were called 'calisthenics,'" Trent says with a chuckle. "Now it's 'cross-fitness.' When (Gary Jr.) was younger, I always incorporated plyometrics — situps, pushups, jumping jacks, bear crawls, lunges. You do everything you can do to strengthen your body without weights." Trent Jr., his father says, "already has an NBA body." The younger Trent won't turn 20 until January. "He is definitely going to get stronger as he matures," the senior Trent says. "But everything needs to go another few notches up." Trent Jr. — the eldest of his father's four sons — has been a prodigy from an early age. He was even a standout in Pop Warner football, playing "quarterback, running back, receiver — he did it all," his father says. The Trents moved from Columbus, Ohio, to Minneapolis when Gary Jr. was in fourth grade. Since then, he has been a star on elite teams at local, national and international levels. He helped Apple Valley High to the state prep championship as a sophomore, was a member of three clubs that won AAU age-group national titles and played on the U.S. team that won gold at the U-17 World Championships. "My son has always been a winner," Trent Sr. says. "He has always had success playing alongside high-level talent. That will make his transition to the NBA easier." For his senior year of high school, Trent Jr. attended Prolific Prep Academy in Napa, California, leading the team to a 29-2 record while playing a national schedule. Then it was on to Duke, where he started all 37 games on a Blue Devils club that went 29-8 and lost to Kansas in overtime in the Sweet Sixteen. Trent Jr. averaged 14.5 points while shooting .415 from the field, .402 on 3's and .876 at the foul line in 33.8 minutes per contest. 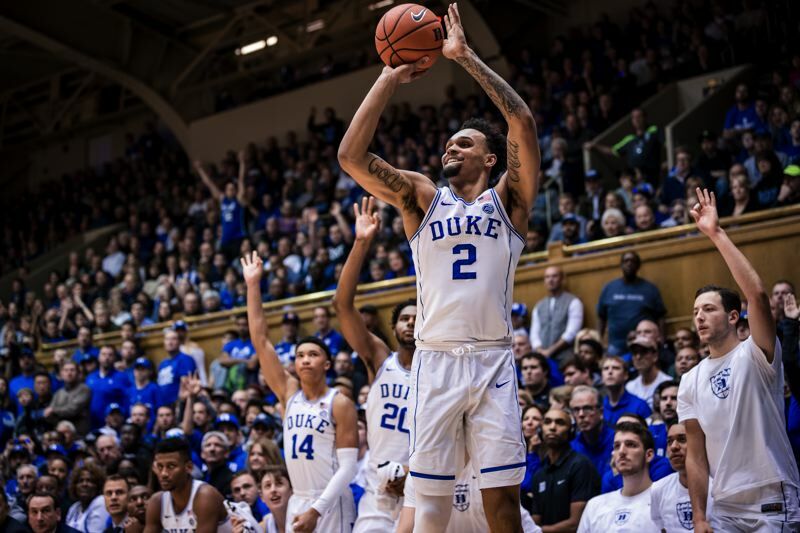 Trent Jr. broke JJ Redick's school freshman single-season record with 97 3-pointers, becoming the fourth freshman in Duke history to lead the team in 3-point percentage. He was named to the NCAA All-Midwest region team. After he declared for the draft, Duke coach Mike Krzyzewski offered his endorsement. "Gary is already a man," Krzyzewski said. "He is physically ready to play in the NBA, and has shown with his 3-point shooting ability that he can knock it down. "He has a big upside. He can complement really good players. He can be an asset to a team right away, especially a playoff contender, because he can score." Was the senior Trent disappointed his son was a second-round pick? "Not at all," he says. "We knew he had first-round talent. Through his years in basketball, he has always been a kid who played all aspects of the game. For the last eight months in college, he did not get to display those things. "(At Duke), they wanted him to spot up and space the floor. That was his role. People get the perception you aren't capable of doing things when they're not on display. If they make you stay at the speed limit, that doesn't mean you're not capable of taking your Bugatti up to 200 (miles per hour)." During Las Vegas Summer League play, Trent Jr. averaged 11.4 points in 23.1 minutes but made only 28 of 79 shots (.354) from the field. "He did above average," his father says. "There were a few opportunities to knock down some shots that were missed. But adjusting to coming in off the bench, the rhythm and pace of the (NBA) game, the physicality — he did a decent job. He's still growing. He's still improving. He doesn't think he was the MVP. He knows he has a lot of work to do." How does Trent Sr. feel his son will fare with Portland as a rookie? "He'll do great," he says. "He'll take his lumps, just like all rookies. There will be some days where he'll take advantage of his opportunities. He will always be a hard worker. As long as you do that, you can sleep at night." Long-term, Trent Sr. has big aspirations for his eldest offspring. "My son has a chance to put his stamp on the game," he says. "I look at some of the guys in the NBA and where they were at 19, guys like Redick, Klay Thompson, Jimmy Butler, Devin Booker. "(Gary Jr.) is ahead of some of those guys at that age as far as shooting. He did a great job of shooting with limited opportunities in college. Once he gets the opportunity to play more and adjust to the system, it's going to come. It's about being prepared when that opportunity arises."